Moviemakers are understandably concerned about policing portions of their films that appear online, especially before the theatrical release date. But this takedown of material from The September Issue may be just a bit overzealous. Why, you ask? Well, R.J. Cutler's documentary of the making of Vogue's largest annual issue, filmed back in the days when abundant ad pages cushioned editorial content like down comforters piled on an antique bed in a New England B&B, is the product of A&E IndieFilms in association with Actual Reality Pictures. Which means that ARP somehow managed to take down its own linked content from YouTube. Either there's a story here, or someone needs to reprogram the lawyer-bots. Why buy that fall dress now when it's likely to go on sale even before the weather is cool enough to wear it? "Could someone lead a committee that would make ground rules for retailers of when the discounting starts, and then all of the retailers can agree to it?" 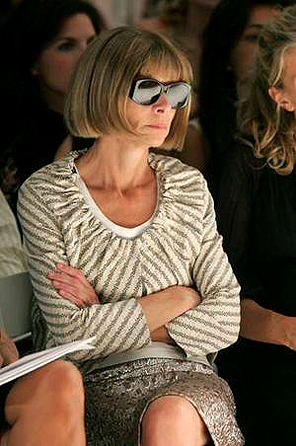 Ms. Wintour suggested. "That's illegal!" [designer and CFDA president Diane] von Furstenberg said with some horror. "Is that something we can change?" Ms. Wintour said. "We have friends in the White House now!" True, some European countries restrict sales to January and June -- but the trend is toward loosening the rules to allow floating sales at other times. And discounted merchandise from previous seasons is available 24/7/365 via increasingly popular websites like Yoox, Gilt, and Outnet. In the U.S., despite the Supreme Court's relaxation of the limits on vertical price restraints two years ago, it's hard to imagine Congress telling retailers NOT to put goods on sale. Especially in a downturn. There's no doubt that Fashion Week, originally an engine for both sales and publicity, has overheated and threatened to stall. Or that delivery dates that put wool coats in stores in July are out of sync with an instant gratification culture. Or that Saks' 70% markdowns last fall created an unprecedented rush to the bottom as luxury retailers fought to unload excess merchandise. Or that consumers are wearing their wallets a bit tighter at the moment. But is a new law really the answer? Discounting isn't unfair, unethical, or immoral -- it is in essence a bargaining process between designers and consumers via retail outlets. The original price is an offer that the customer is free to accept or reject, and it's blatantly apparent that factors from oversupply to the economy are causing her to stand and wait until that price drops. More interesting is the fact that some beautifully designed, high-quality, limited-quantity items -- from classics like Hermes handbags to fashion pieces like Balmain's $10,000+ jackets -- are still selling out, at full price. The same is true for coveted items at the budget end of the spectrum. Yes, Fashion Week can and should be re-engineered to showcase clothes, not celebrities, and the delivery calendar can be improved. At the end of the day, however, the industry needs to place its trust in design and designers, not in jousting with the Department of Justice. Jersey, one of the British Channel Islands, has long been associated with its namesake stretchy knit fabric, an integral component of modern fashion. New Jersey, an unfortunate interlude between New York and Philadelphia, has long been associated with stretching the law. It is seldom mentioned in the same breath with fashion. Nevertheless, fashion plays a key supporting role in the latest New Jersey corruption scandal. 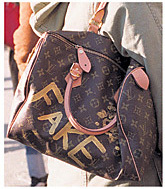 While allegations regarding crooked mayors, money-laundering rabbis, and kidney traffickers have filled the headlines, it's amusing to note that the FBI's key informant posed as a manufacturer of counterfeit handbags. In several conversations excerpted in the criminal complaints (here, here, and here), "cooperating witness" Solomon Dwek indicated that the money in need of laundering came from the sale of bags manufactured in Brooklyn with fake labels. "Business is very good. Prada, Gucci, boom, boom, boom." Really? Even if the alleged money launderers were willing to do business with a guy who had been arrested for bank fraud only a year earlier, you'd think they'd have better sense than to believe that a large-scale counterfeit manufacturing operation was located in Brooklyn rather than overseas. Adding fake labels to generic imports, maybe, but start-to-finish production? In this century, that would be a real stretch. The end times have arrived. From Neiman Marcus' trademarked Last Call to the Final Days of Barney's Designer Sale, bargain shoppers will either be united with their red Louboutin solemates at 70% off, among other legendary discounts, or be condemned to wait for next season. Or will they? The proliferation of designer discount sites, from Bluefly to Yoox to the Gilt Groupe, not to mention eBay sellers, has conditioned us to look for year-round bargains. Even the 90% off Jimmy Choo or Manolo Blahnik is no longer automatically dismissed as an urban legend, especially after last fall's extreme sales. But perhaps we've grown a bit too credulous. Jane Ridley at the New York Daily News launched an investigation into one of the more recent online attempts to fool consumers, glossy websites dedicated to the highest of heels at the lowest of prices -- and she doesn't like what she's found. Check out her article, photo essay, and helpful tips here (complete with quotes from your favorite law prof -- thanks, Jane!). 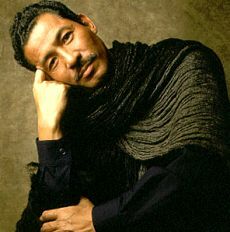 Japanese fashion designer Issey Miyake, known for technological innovations such as his Pleats Please line, today extended an eloquent editorial invitation to President Obama. On Universal Peace Day, August 6, Miyake would like Obama to walk across the Peace Bridge in Hiroshima, Miyake's childhood home and the place where he witnessed and survived the world's first atomic bomb attack. This designer's venture into international law and diplomacy is all the more forceful for his previous silence; Miyake never wanted "to be labeled 'the designer who survived the atomic bomb.' " Whether or not the President's schedule permits him to respond accordingly, it's worth listening. 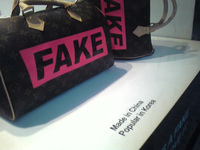 ...and artist Zinwoo Park took the next illogical step in the authenticity mind game, placing a "fake" label on a real Louis Vuitton Speedy. 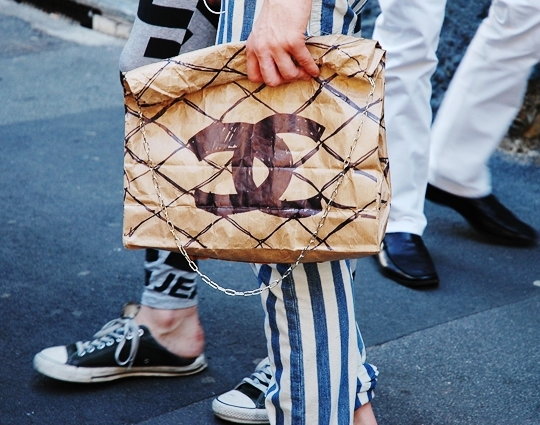 This crumpled "Chanel" doesn't provoke quite the same mental gymnastics, but it may just be the quintessential example of dark humor for the downturn. Or perhaps the prototype for a new celebrity collaboration: Ruth Madoff for Chanel. Many thanks to clever Counterfeit Chic correspondent Kristina Montanaro, who spotted the paper bag over at HighSnobette. Bravo's Fashion Show may be no Funkyzeit mit Brüno, with an entirely parodic fictional fashion designer at its core, but it does have its share of references to imitation. From the very first episode, there have been teasing references to knockoffs, including the judges' speculation as to whether contestant Johnny's winning homage to Gianni Versace was a bit too on the money and, in a subsequent week, Johnny's own aside noting that he'd often knocked off the designs of audience member Erin Fetherston. Tonight, the critics of copying finally had the opportunity to sharpen their claws on Johnny's version (below right) of the Spring 2009 one-shoulder Lanvin leopard gown -- a look that not only graced multiple red carpets (including on Maggie Gyllenhaal at the Golden Globes, below left) but also set off a consumer stampede in search of colored animal prints. To his credit, Johnny had the grace to confess embarrassment at his lapse of memory (or judgment), at least while onstage. And what's the greater crime of fashion -- the lack of integrity evident in stealing another's acclaimed work, or the creation of an unflattering outfit? 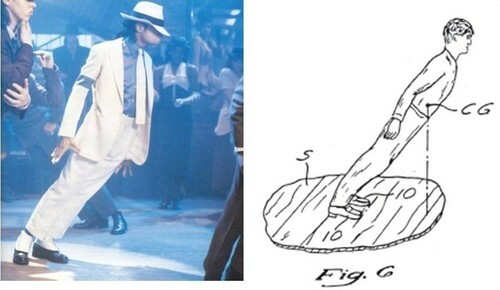 The judges debated a bit -- but when it comes to copying in the context of a competition, they just weren't buying it. Bravo! Few dispute the familiar adage that a person who acts as her own lawyer has a fool for a client -- but is the same true of a person who dresses herself? I think people who have worked with stylists believe they have learned enough that they can step out on their own....But it's like having some legal issue pending and going to court and defending yourself because you took a few legal classes versus going with a lawyer. Which one do you think will have a better outcome? Perhaps Verdi's just vamping. After all, the bio on his website notes that his parents wanted him to be a doctor or a lawyer. (Sound familiar?) Then again, maybe he's got a point; analyzing red carpet wrecks has become a cottage industry. A system for allowing a shoe wearer to lean forwardly beyond his center of gravity by virtue of wearing a specially designed pair of shoes which will engage with a hitch member movably projectable through a stage surface. 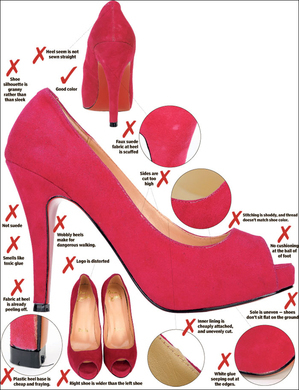 The shoes have a specially designed heel slot which can be detachably engaged with the hitch member by simply sliding the shoe wearer's foot forward, thereby engaging with the hitch member. Perhaps not poetry on paper, but certainly poetry in motion -- which is as much as one can ask of a patent, or a pop star. UPDATE: The 8-page program handed out at the memorial service includes photos and quotes from those who knew Michael, including Tito, who notes, "My brother developed a shoe that showed resistance to gravity. What a man!" Via the New York Times live blog of the event. Fashionistas whose hearts beat for red soles -- or, more precisely, Christian Louboutin's scarlet stunners -- are wondering whether Michael Kors "borrowed" the trademarked hue for the soles of his pink-toed beige pumps. The two-toned teasers have turned up in quite a few recent editorial features, including a Marie Claire post calling them the new "it" style of the season. But are the soles truly red, or merely a misleading shade of dark orange -- as turned out to be the case in the Versace ads featuring Gisele last year? Go forth, shop, and report back! And while we're speculating, will Cesare Paciotti's dagger-decorated red soles, which appear in the July issue of Vogue with only a telltale sliver of true red color visible, continue to strike at the heart of the Louboutin mark? Thanks to dedicated reader Samantha Rothaus (and her mother!) for questioning Kors course! What's an Independence Day weekend without rockets' red glare and bombs bursting in air -- or at least a video game-inspired facsimile? 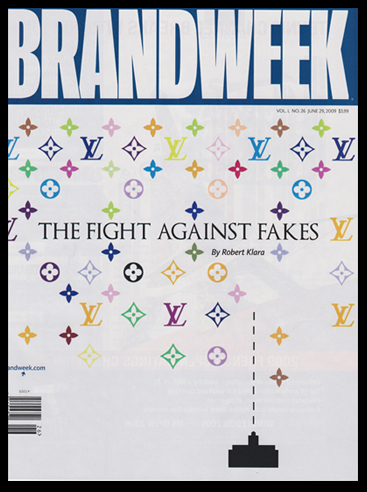 Check out the current issue of Brandweek for a presumably unauthorized editorial interpretation of the Louis Vuitton Multicolore toile on the cover (and the somewhat more prosaic accompanying article, "The Fight Against Fakes," on the inside). Who knew that those little LV logos were actually alien life forms? Lululemon, makers of the the comfortable cult yoga pants that can vacuum-pack your thighs in place before you've done a single downward dog, has an unusual approach to fighting fakes: transparency. And we're not talking fabric. Many frequently copied companies treat the issue of counterfeits like the elephant in the living room. Everyone knows its there, but -- by order of the PR department -- nobody mentions it out loud lest the brand be associated in the public mind with cheap knockoffs. Others openly acknowledge the problem, but only in statements about the harm caused by copying. A few go so far as to provide a link for consumers to report suspected fakes, but you probably won't find it on the front page of the website. 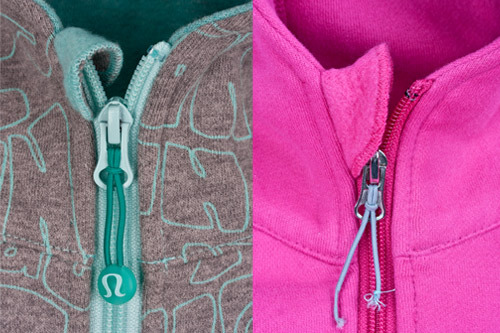 Lululemon has gone one step further, posting a detailed explanation of how to spot a counterfeit hoodie, complete with 9 points of comparison and closeup photos of the real one (grey) and the fake (shocking pink, alas). These range from the obvious, like misspelled words on the fake tag, to particular construction details, like flatlocked versus merely serged seams. While Lulu may very well be holding back a few covert particulars to avoid giving copyists a complete how-to guide, the information is sufficient to help fans feel knowledgeable and avoid unscrupulous sellers. At the same time, it underscores the message of quality in a cool way that merely announcing, "Hey, look at our YKK zippers and straight topstitching!" couldn't. In the words of Lululemon's mix-and-match manifesto, a collection of exhortations and aphorisms, "Life is full of setbacks. Success is determined by how you handle setbacks." If Lulu's approach to the cheap copies is any indication, predicting the company's success doesn't take much of a stretch. Thanks to thoughtful Counterfeit Chic reader Briana C. Hill for the tip!